Don’t make cutting bread or bagels a chore. 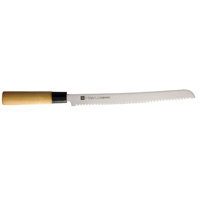 If you’re looking for the best bread knife on the market, look no further. Choose Alfi bread knives to provide a clean and smooth cut instead of tearing and crushing the bread. We have a huge selection of different bread knives, sandwich knives & baker’s blades, so you’ll be sure to find a bread knife that you love. Whether you are slicing through bread rolls, baguettes or Italian bread, there’s nothing better than a clean and effortless cut. For a high performance professional bread knife, make sure to check out the Alfi Cutodyanmic Knife. It is sure to make your bread cutting effortless. We also offer our famous Alfi bread scorer, which is the most effective, economical and effortless scoring solution around.